Product prices and availability are accurate as of 2019-04-22 07:27:10 UTC and are subject to change. Any price and availability information displayed on http://www.amazon.com/ at the time of purchase will apply to the purchase of this product. 100% UV Olefin Fiber, 3/16"thick with a Medium Density for Indoor & Outdoor use Easy To Clean. Just Hose Off & Dry! 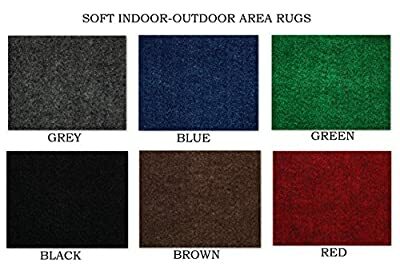 Great rug for the patios, decks, gazebos and balconies, trade shows, booths, and other parties and events SHIPPING: Due to standard shipping size limitations some rugs will have to be folded to meet the shippers required dimensions. This may cause some minor creasing when you first receive your rug. Simply unfold and lay flat in your desired location and these creases will diminish in time.